Websites capturing your data has been a hot topic since the news broke on Facebook selling data to Cambridge Analytica who in turn used this data to try and sway public opinion. This is by no means a new practice, and digital marketers have been collecting data on internet user activity for years. The way data is collected and stored will go through some changes in the next couple of months with the introduction of the EU General Data Protection Regulation (GDPR) which is said to be the most important change in data privacy regulation in 20 years and companies like Google are preparing for it with an update to its data retention controls in their Analytics platform. 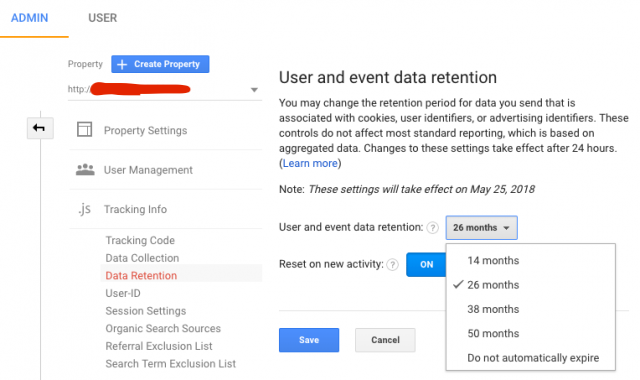 Google will now provide Analytics users with Data Retention controls which gives you the ability to set the amount of time before user-level and event-level data stored by Google Analytics is automatically deleted from Analytics’ servers. These settings will not take effect until May 25, 2018. What is the reason for the policy update? After four years of preparation and debate, the GDPR was finally approved by the EU Parliament on 14 April 2016. The enforcement date: 25 May 2018 - at which time those organizations in non-compliance may face heavy fines. The retention period applies to user-level and event-level data associated with cookies, user-identifiers (e.g., User-ID) and advertising identifiers (e.g., DoubleClick cookies, Android’s Advertising ID, Apple’s Identifier for Advertisers). However, your aggregated data will not be affected. When data reaches the end of the retention period, it is deleted automatically on a monthly basis. If you change the retention period, then any affected data is deleted during the next monthly process. For example, if you change from 26 months to 14 months, then any data older than 14 months is removed during the following monthly process. Turn this option ON to reset the retention period of the user identifier with each new event from that user (thus setting the expiration date to the current time plus retention period). For example, if data retention is set to 14 months but a user initiates a new session every month, then that user's identifier is refreshed every month and never reaches the 14-month expiry. If the user doesn't initiate a new session before the retention period expires, then that user's data is deleted. If you do not want the retention period for a user identifier reset when that user has new activity, turn this option OFF. Data associated with the user identifier will be deleted automatically after the retention period.